When your Mac is not starting up, it can be due to various reasons. Generally, Mac does not produce problems, it can work long hours without any hiccups. Lucky people can go years without having any issues with their Mac computers. However, this does not mean there can never be an issue with the devices. At times, Mac might not complete the booting process which can lead to a lot of issues later. It can disrupt your work in between and lad you in trouble. We understand how important your Mac is and that is the reason we have come up with solutions. How can I solve my Mac-Book Startup issues is a common query we receive every now and then and our experts at UAE Technician are proficient in dealing with these issues. You can consult them about anything you want on the startup issue. In case, your Mac is failing to reboot then you will find yourself staring at a blank screen. At times, booting in Safe mode can help solve the problem, but that too is not a full proof solution, it might work on some and still show issues for the rest. 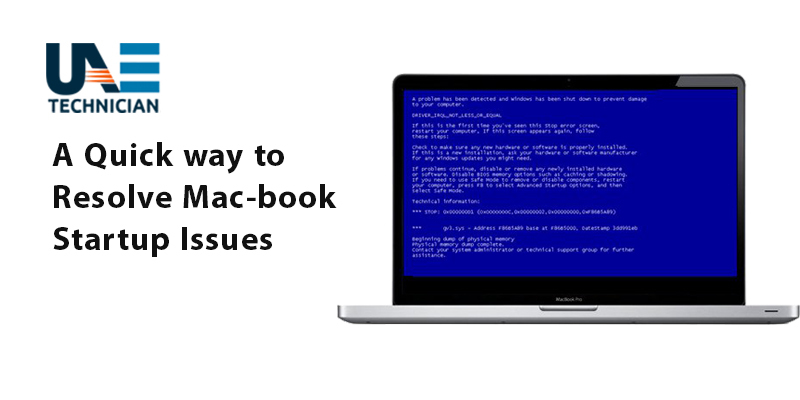 Suddenly if you face the blue screen during startup, then it can for any Mac’s startup item malfunctioning. It becomes difficult to detect what is actually causes such issues. Your system disk and directory may have issues for which the Mac is unable to run the booting process. This is why it is causing the booting spills. How can I solve my MacBook Startup issues is the persistent annoying question that troubles users. Meanwhile, there can be some applications which are known to freeze Mac. The applications hang and that leads to a lot of issues. The battery can also the trouble. When Mac’s battery is not charging, then it might be for insufficient power supply to start up the device. Your RAM might be creating the issue. It holds some essential elements that help in the smooth booting of the device. The SMC (system management controller) is responsible for taking care of the hardware functions and also the operation of the power button. It can also be the reason for Mac’s startup issue. These were some of the common reasons why you might have queries like How can I solve my Mac-book Startup issues. Every time it is not possible for the user to be able to detect the cause which makes the situation worse. Also Read: How to Save Your MacBook from threats like Malware, Virus or Ransomware? If you are unable to diagnose the problem correctly then it will be difficult to go for the fixes. That is the reason it is recommended to go for expert help whenever you face any issues with Mac PCs. After the warranty period repair services also become very expensive. Therefore, if you are looking for service providers for MacBook Repair in Dubai, then UAE Technician is your ultimate destination. Moreover, our service also covers MacBook Liquid Damage Repair Dubai. For further assistance reach out to the experts and rescue your Apple computer from falling into bigger troubles. Our experts offer effective services that will restore your Mac to a working condition. No matter wherever you are located, our service network is available and can cater to you anywhere in Dubai. We are proud to serve thousands of customer with Mac PC troubles and it gives us immense pleasure to see the customer’s satisfaction. You can call the professionals by dialing the helpline number 042053349 or chat with them via Live Chat facility. You can also mail them about the issue, they will get back to you within a stipulated time frame.